Last weekend, I was looking ahead to week 3 of our training plan and fired off a frantic text to Toni, "holy crap we're racing next weekend already!" We had signed up for the 605 Race Series a few months ago, and they've been on the calendar since then, but somehow it's already the end of July and I'm just not sure how that happened! 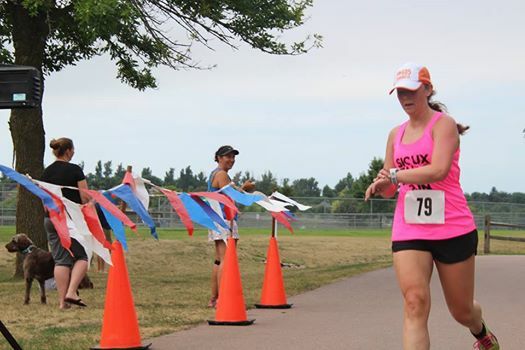 The race series is a 4 mile, 8 mile, and 12 mile every other Sunday leading up to the Sioux Falls half. I was hesitant about signing up, because I know that "racing" 4/8/12 leading up to the half won't benefit my training, my Toni insisted we sign up, and not race them. And duh. She's totally right. The race series supports my favorite running store, their wheelchair race adventures, it's super cheap, there's awesome prizes, and even though they say it's low/no frills, I won at least 1 nice pair of running socks last year, and to me that's MUCHOS FRILLS! The plan for Sunday's four miles includes 8 miles with 4 at tempo-ish. This is the one race of the series I'm actually planning to all-out race. I think we'll do a 2-3 mile warm up, 4 miles race and then 1-2 mile cool down. Based on my best 3 mile of this summer, McMillan puts me at an 8:30 pace for the 4 miles. That'll be my A goal for Sunday. My last 5k was at a 8:39 pace, so I'd be pretty happy if I could do 4 miles at that, especially if the weather is more favorable than it was on the fourth. Otherwise, my last, and only, 4 mile race was during this series last year, and I completed it in 9:06 pace. Our tempo paces have been around 9:05-9:15 in the 100% humidity over the past few weeks, so 4 miles at tempo would still be a great workout for the day. Either way, I'm looking forward to running and racing with a bunch of my friends and supporting our local running store.